We also deliver to the East Bay area, and the Reno area. Kosich Firewood was expanded to the Tahoe Truckee area in 2008 after flourishing in the Bay Area since 1982. With hundreds of satisfied clients our first year we will continue to expand our operations with increased amounts of wood already in stock. 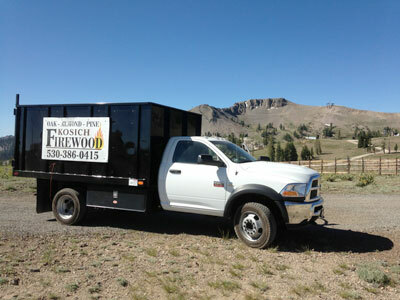 Currently our Truckee location is servicing firewood customers in the following cities. Don't see your city listed? submit a quote request and we'll verify it for you. To place an order in one of the cities above please fill out the online form below or give Jason a call at 530-386-0415. Online requests will be returned in the evening but phone calls will be taken at all times of the day. *Border on map is approximate. If you are near the border, please give us a call, or use our online form to request a quote.